This is a great thought experiment to challenge young designers and engineers. How would you go about calculating the fastest speed at which a Tyrannosaurus Rex could fall? To get started, one must first understand the concept behind terminal velocity. When an object is falling, it has two forces acting on it: the pull of gravity and the friction of air pushing back. Earth's gravity (g) pulls objects at an acceleration rate of 9.8m/s^2. An object will keep accelerating until the friction of air slows down the acceleration to a stable velocity, or terminal velocity. There is a bit more going on to figure out the terminal velocity of a Tyrannosaurus Rex. This is a balance between the mass (m) of the object and the surface area (A) of the object through a certain density of air (p) as well as the drag coefficient of the object as it moves through the air (Cd). The gravitational constant (g) only changes if you go off-planet. We'll stay on Earth today to not get too crazy at 9.8m/s^2. We'll also assume that the T-Rex can reach terminal velocity by the time it reaches 2200km altitude, which has a pressure of 0.99 kg/m^3. We then have to make a decision whether the T-Rex is falling in a streamlined nose-firstor simply an uncontrolled sideways fall. 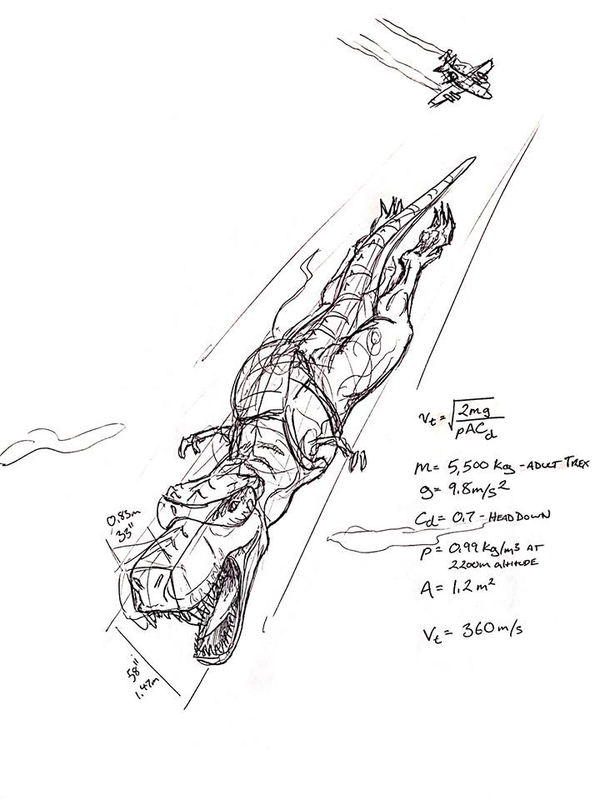 Let's go for speed and say that the drag coefficient is really low at 0.7 and that the area (A) of the T-Rex falling is the front skull dimensions of 1.2m^2. When you drop all of those inputs into the formula, we come to 360 m/s, or 807 mph. As an aside, the speed of sound is 340 m/s, so a skydiving Tyrannosaurus would be the first animal to generate a sonic boom. If you're looking for extra credit, ask your budding young engineers to calculate the size of parachute needed to stop this T-Rex.